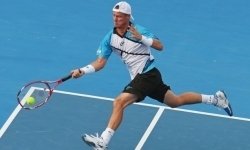 The only singles match Lleyton Hewitt ever played on an outside court at the Australian Open tennis championships, was at the tender age of 15. It was against two-time French Open champion Sergi Bruguera. Lleyton still remembers the spin Sergi hit on his forehand, he had never experienced it before. Lleyton lost in straight sets on that occasion. Following his 19th consecutive appearance at the 2015 Australian Open, the only Australian to do so, it's a dream come true for Lleyton who was approaching his 34th birthday!